Three members of the Fox family have set themselves a major challenge while supporting two local charities this summer. Barry, Damian and Michael Fox will take on the arduous cycle from top to bottom of Ireland from 24th-28th August. The Kevin Bell Repatriation Trust (KBRT) and the Public Initiative for Prevention of Suicide and self-harm (PIPS Newry and Mourne) will be the beneficiaries of the fundraising drive the three men have also embarked upon. The lads are already in training for the Malin Head (Donegal) to Mizen Head (Cork) challenge, which they will complete in 5 tough days. 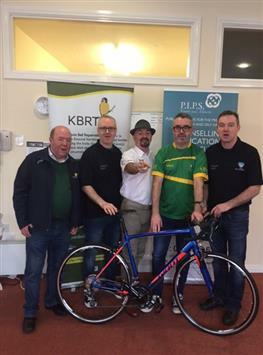 Pictured at the launch of the challenge are Collie Bell (KBRT) Damian Fox, Tony Smith (The Banter Show) Michael Fox and Eamon Murphy (PIPS Newry and Mourne). Bike courtesy of Bridge End Bikes Newry. To support the Fox trio you can follow instructions through their Facebook page ‘Malin Head to Mizen Head Charity Cycle 2017.